Weekend Devotion: Stay connected to the Vine and thrive baby thrive. Spiritual growth is a byproduct of intimacy with God, not self effort and striving. “I am the Vine, you are the branches. If you remain in Me you will bear much fruit. Apart from Me you can do nothing,”~Jesus (from John 15:4-5). The miracle plants that have thrived in my house focus on their source. They grow towards the light, they respond to being watered/fed, they stay connected to their source. Any vine that disconnects, shrivels up and dies. Why? It has no source of it’s own. We each have a body. If you cut off part of your body from the blood supply, your beating heart, and your nerve ends are depleted of oxygen-guess what? That part of you will decay, die, rot, atrophy. 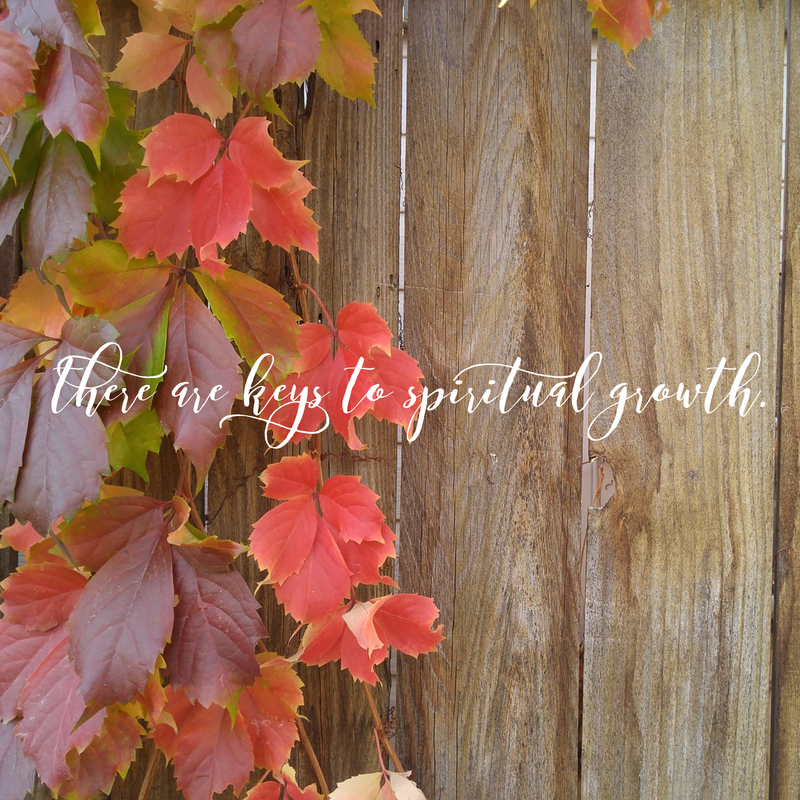 Spiritual growth is similar. God is the Source. We are pretty special to God. We are not God. He is the all sufficient One. He knows exactly what is needed to grow us up into tall thriving vines. We can yield and grow or buck Him and stay the same size. God loves multiplication and growth. Stagnation is not His speciality. You read in the parable of the talents God likes to reproduce what has been given. Why? If we are blessed, displaying His glory, then more people can be blessed. We can pray for God to bless people, yet He empowers us to be a blessing. 1. Stay connected to God. One of my morning routines is, “Morning Papa, Jesus, Holy Spirit. Love You. Thank You for everything. What do You want to do today? What’s on Your heart. I invite You into my day.” It’s not every day or I feel bad. It’s a habit of letting God know He is welcome in my life. God is always there. He is not always invited to participate. He is sometimes relegated to the back seat. He is spoken to for needs, complaints, everyone else is busy, boredom, obligation, or never. God likes to be included. Not for control purposes, because He loves connection with humans (This I do not fully understand). I LOVE consultations with God. Why? He sees everything. He sees the heart, motives, past, future, impact, everything. God’s view is not tainted nor one sided. He sees it all. We become like the gods we worship,~Ralph Waldo Emerson. Worship is more than singing songs. Worship is a lifestyle of adoration. Worship is love. Who or what do we love? Where is our identity rooted? Only God is worthy of worship. Why? He alone is 100% good. Worship pleasure, become an addict. Worship beauty, become vain. Worship food, become glutton. Worship money, become greedy. Worship power, become a dictator/tyrant. Worship self, become grossly selfish. Worship people, become a people pleaser. Worship of God takes our eyes off ourselves and places them on God. Looking inward, navel gazing, leads to self defeating behaviors and pride. We are either looking inward and seeing all that is wrong or looking inward and patting ourselves on the back for how awesome we are. The truth is we are not the source of light, God is. Our true growth comes by basking in His light, not looking for our own. One of the greatest tools of the enemy is getting humans to turn their gaze away from God. He will even use good things like relationships, family, ministry, serving. If he can replace activity for intimacy, then he knows eventually that person will run out of steam. The power and growth is not in self, it is in God. Look up. Look at Jesus. Focus on who God is. Focus on what God has done. The devil since the beginning has been trying to put a wedge between God and humanity. He knows God is good. He is also jealous of the connection between mankind and God. He wants to be worshipped, if not directly he will settle for false gods. Anything to keep people from knowing God and loving Him. Plants need pruned. Our hearts do too. Weeds can sprout and grow…weeds such as bitterness, fear, unforgiveness, selfishness, lust, pride,…they come to choke out love. We were created by Love (God), to be loved, then to love others. Trials come sometimes as tools of pruning. We need more patience so God allows some challenges. Every challenge or storm is not the devil. God allows some things because we need to grow up. Let me give you an example. I am the “Let’s get this done, we have plan A, B, C. What is our contigency plan? Early is better than late. I will do what I said. Let’s be efficient, excellent,” type personality. God allows me to be connected with others who have no plan, are not organized, everything is last minute, oh I forgot-was that today, always late, no concerns about efficiency-what’s that?, just go with it…type people. At first it caused frustration. Then I learned to yield to the challenge. I learned to set boundaries, invite tardy people earlier than they needed to be there, cast vision, inspire planning, and go with the flow when it’s unnecessary to map it all out. I learned to love those very different from me and appreciate their personality. They are looking to have fun. I am normally seeking to build, develop strategies, multiply, and be efficient/excellent. I have fun. I also like building. That challenging person may be God’s way of producing greater patience or love. That season of waiting is not God is doing nothing. If we yield we see a seed is hidden in the dirt a long time before it pops through the soil. I baby is in the womb 9 months. We prefer trees over a field of seeds, and fully developed babies over fetuses. Yielding to correction is also a way to grow. God created us to be fruitful. Being fruitful is more than having children. Being fruitful is taking the seeds God has sown, the gifts, talents, skills, and putting them to use for His glory. Being fruitful is yielding to God so the fruit of the Spirit is on display for the world to see Him. Being fruitful is being faithful to whatever and whoever God placed in front of us. Being fruitful is abiding in God so we are a loving blessing. Lord help us to stay connected to You, to live out of Your heart, and thrive through the work of the Holy Spirit. Help us to cease trying to be our own light or looking for others to be our source. You are our Source. Deepen our connection with You in 2017. Take the focus off insignificant things. Help our gaze be fully on You! In Jesus powerful name. Amen. Morning Devotion: God partners with ordinary people to do extraordinary things. Man judges by his natural eyes; God sees with His Spirit. Everyone rejected by man is not rejected by God. The true power is not in the person. It is in God. We witness through Jesus the power of abiding and surrender. Intimacy with God produces GOOD fruit. Our strength lies not in our intellect, human wisdom, gifts, titles, accolades of man, or talents. Our strength lies in intimacy with God. Out of abiding flows abundant good fruit (John 15:4-5). David was overlooked by his natural father. No one was looking for him. Yet God knew He placed inside of David the heart of a King, a warrior, and a man who understood worship. David would have appeared to his peers as ordinary. Yet God anointed him to be extraordinary and do extraordinary things. What is rejected by man is not rejected by God. There are many other men and women who were outcasts or overlooked by man and elevated and promoted by God. God isn’t looking for the opinions of people to do His will. He does not function in a democracy. When God chose Apostle Paul, he was first Saul-murderer of Christians. He was disliked and feared. God knew who He created Paul to be. It was not truly about Paul, it was about the power of God and spreading the Gospel to the Gentiles. God often displays His love and power through weak and broken people. Why? It’s not ultimately about us, it’s about God. How many times in life have we discounted ourselves or someone else because of the outside package, weaknesses, past experiences, lack of titles, no one else seems to vouch for the person, lack of celebrity, brokenness or imperfections, or lack of star appeal? It is imperative no one is discarded or treated as though they have no value. A diamond in the rough looks like a simple rock. It is a rock worth millions. God does not create junk. Every person has tremendous value. It is not about what we can do or what another person is anointed to do. We will never be qualified enough on our own to do all God called us to do. Why? God is so much bigger than our dreams or limitations. He is GOD. It’s about Him. It’s His story for His glory. His super invades our natural. 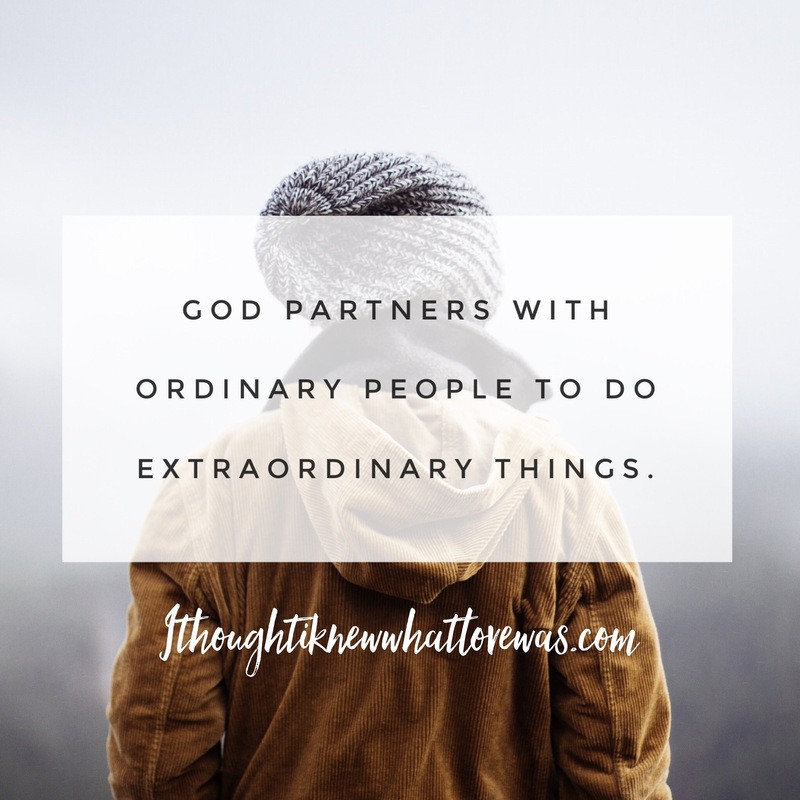 God partners with ordinary people to do extraordinary things so the world can see His outstanding love. It’s not about ego for God. He is after connection, relationship, and intimacy. He proclaims to humanity, “Let Me show You My great love.” He partners with ordinary, imperfect people to bless the world! My encouragement is look up to God, connect with His heart, and know God is SO much bigger than any brokenness, pain, limitation, barrier, colored past, lack, or man made qualifications. Man judges with the natural eyes and God looks at the heart. Is God vouching for you? If so, no man on earth can stop Him. The goal is connection with God. God is outstanding and He is seeking willing vessels. Is that you? Is that person you think is not good enough or qualified? God uses the small, overlooked vessels to display His awesome love and power. The miracle is not in who we are or what we have. The miracle is rooted in who God is. It is not about what mankind can do. It’s about what God can do through mankind. May the limitations be taken off God and the worship of the titles or people He partners with to bless the world. All eyes on God. He is outstanding! !